You like to have always sharp knife? Specially for your fantastic steaks! Your friends and guests do admire you for your soft ad tender steaks and the smoothy of cutting? We have the newest technology for you! DSNN Ceramic Steak Knifes. please check other colors in our store. When it comes to slicing and cutting, a great knife saves you time and trouble. Sharp kitchen knives on sale and kitchen knives online are modern innovations designed to improve your culinary experiences. kitchen knives professional is made of good material which help to maintain each food's taste. Environmental friendly kitchen knives ratings is easy to clean to prevent bacteria growth. Attractive kitchen knives review is comfortable to grip and handle. Efficient kitchen knives reviews will provide an optimal ergonomic experience. Our store has the best selection of Kitchen Knives in stock. Best staff for barbecue season. ➤ULTRA-SHARP CERAMIC BLADE: provides maximum sharpness. ◀ The DSNN Ceramic knife blades are made from high quality zirconia and went through high temperature burning, which makes an shining elegant surface, and boost its sturdiness.Matching knife sheaths is a must. It protect you against hurt and knife blade against damage. 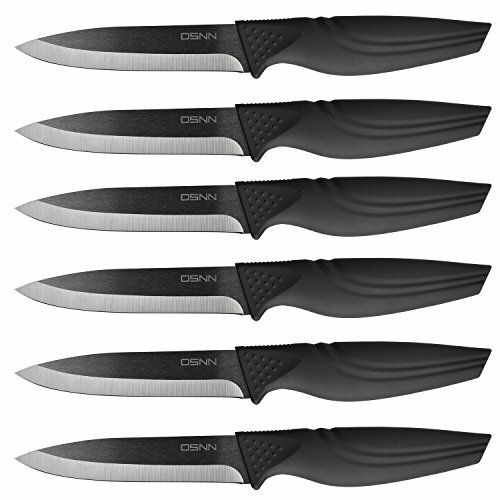 ➤MULTI-FUNCTIONAL KNIFE: DSNN ceramic knife is classified and designed to be multipurpose knife for professional applications .◀ It is perfectly time saving for cutting, dicing, slicing of fruits, vegetables, meats,meat off bones and many others. The 4" knife is lightweight so your hand will not get tired,exceeding all your expectations. ➤ELEGANT& UNIQUE DESIGN: Ergonomic handle design that looks great for your fantastic steak.◀ Cooking is an art and your knife should look like a piece of ART too . It is the time to show off your top of the line steak knives and the culinary skills. ➤EASY WASHING:only hand wash, rinse and wipe with a kitchen towel. ◀ Healthy DSNN ceramic knife blade does not absorb food element, which means all sliced food preserve the original color and taste, no smell or odor gets transferred. So it allow an easy-quick cleaning. ➤IDEAL GIFT:DSNN Ceramic knife together with matching knife sheaths nicely wrap in a nice gift box.◀ It makes a great gift for anyone who likes steak. Perfect gift ideas for for Housewarming, Weddings, Birthdays, Hanukkah,Thanksgiving and Christmas. If you have any questions about this product by DSNN, contact us by completing and submitting the form below. If you are looking for a specif part number, please include it with your message.